Earnings HQ: FBN’s Adam Shapiro breaks down ExxonMobil’s first-quarter earnings report. Exxon Mobil Corp&apos;s first-quarter profit dropped less than expected in results posted on Thursday as margins at the refining unit of the world&apos;s largest publicly traded oil company surged on tumbling crude prices. While pure exploration and production companies have been stung by low prices, integrated companies such as Exxon and Royal Dutch Shell are relying on their refining units to bolster their bottom lines. A 50 percent drop in crude prices since June has slashed the costs of feedstock for refiners. "It was a strong quarter (for Exxon)," said Brian Youngberg, analyst at Edward Jones in Saint Louis. "Their diversified model tends to hold up better in a weaker oil market and that is seen in this quarter." 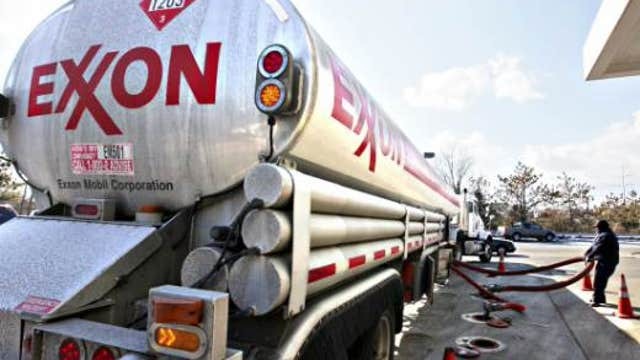 Shares of Exxon rose 0.2 percent to $88.05 early Thursday afternoon. The Irving, Texas-based company earned a first-quarter profit of $4.9 billion, or $1.17 per share, down 46 percent from $9.1 billion, or $2.10 per share, a year earlier. Oil and natural gas output was 4.2 million barrels oil equivalent per day (boed), up 2 percent from a year earlier. Since the price crash, Exxon said it has driven down costs 20 percent in its U.S. shale oil and gas fields, as producers demand discounts from oilfield services firms. "We expect increased savings over time," Jeff Woodbury, vice president of investor relations, said of the company&apos;s U.S. shale work on a conference call. Exxon&apos;s refining business had a profit of $1.7 billion in the first quarter, up $854 million from the same period a year earlier. Its international refining unit saw profit rise nearly fivefold. Exxon was not alone among the integrated major oil companies. Shell&apos;s first-quarter profits posted on Thursday were helped by its refining operations. It reported a 56 percent drop in first-quarter net income at $3.2 billion, beating analysts&apos; expectations of $2.4 billion profits. BP and Total reported higher-than-expected profits on Tuesday thanks to their fuel-making units. BP&apos;s refining profits more than doubled and Total&apos;s operating profits from refining tripled.